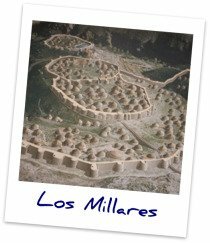 Los Millares:While in Almeria, you shouldn’t miss one of Europe’s most important archaeological sites of the Copper Age. It is located in the municipality of Santa Fe de Mondujar, some 17 kilometres from Almeria city. (Scroll down for detailed location and map). Needless to say that if you visit the site in summer, you should bring enough water and sun protection with you. When we last visited this site in August, it was terribly hot and only my little daughter and I were brave enough to finish the entire route, while the rest of the family members preferred to wait for us at the sheltered entrance. In fact we were almost the only visitors, apart from two other tourists. They strolled around with an umbrella to protect themselves from the sun. It burned down on us and it was almost unbearable, just like in the nearby Tabernas Desert . Exhausted and thirsty, but happy, we managed to take the photographs on this page. By the way, the day before, we visited the Museum of Almeria city, where we learnt a lot about Los Millares. It was very interesting for the kids too (they were recalling some history lessons from school). May be I should mention that before you actually start your tour, you have the opportunity to watch an interesting video (also in English!) in the entrance-office, explaining you all about the life of the people of 'Los Millares'. After that, you have two choices: take the path to the reconstructed area on your left, or take the path to the archeological site on your right. Of course, we explored both. 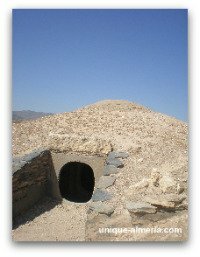 The people of Los Millares (3200-2200 B.C.) developed a splendid farming culture, pioneering the introduction of copper metallurgy in the Western Mediterranean area. There is nothing comparable to be found in entire Europe from that period. 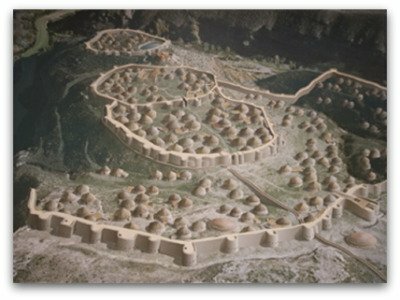 The site consists in four lines of wall and thirteen small advanced forts protected its extensive population. The impressive necropolis has more than eighty collective tombs. The principal economic activity was agricultural (wheat, barley, legumes, etc…), around which the life of the village revolved. There was also livestock (sheep, pigs, goats…) and hunting deers,fallow deers and wild boars played an important role. But, it was metallurgy (cooper) that propelled the development of this culture. With the mineral extracted from the nearby Sierra de Gador, they produced arms, ornaments and utensils for work, that were commercialised in part. The strategic placement of the village allowed its defence: naturally protected on two of its sides, on the banks of a river that was navigable at the time (today it is dry), close to the copper mines of the Sierra de Gador and endowed with a physical environment less arid than today, with fertile fields for cultivation and abundant hunting. The Necropolis is outside of the village and is made up of eighty collective tombs, today poorly preserved, in which the members of the same clan were buried with their personal grave goods. These objects can be observed in the Almeria Museum. There is a reconstructed tomb which is made up of an atrium intended for the celebration of funerary rituals, a corridor lined with slabs of perforated slate and lateral niches for infant burials, and a collective sepulchral chamber. Do you have a great story or advice about Los Millares? Share it!